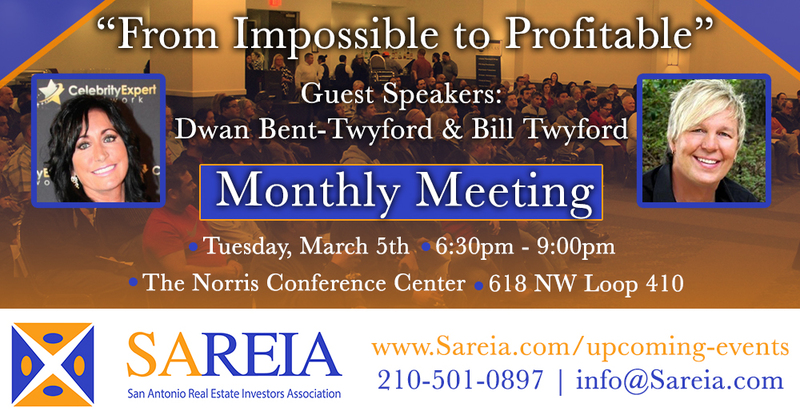 San Antonio Real Estate Investors Association - Monthly Meeting- " From Impossible to Profitable with Dwan Bent-Twyford & Bill Twyford"
Monthly Meeting- " From Impossible to Profitable with Dwan Bent-Twyford & Bill Twyford"
If this is your first time attending a monthly, please email info@sareia.com for the code. To secure a private table, Vendors must RSVP here. Please join us and expert investors Dwan Bent-Twyford & Bill Twyford as they discuss how to acquire properties and flip houses to make a huge profit. Bill & Dwan Twyford are professional real estate investment coaches and mentors. With over 2,000 real estate transactions under their belts, they have created a duplicatable system to help you find the same success. Dwan Bent-Twyford, America’s Most Sought-After Real Estate Investor™, started as a broke, single mom who had been fired from Denny’s. She now heads up “The Investors Edge University” - A company that specializes in training new and seasoned investors in a wide range of real estate investing techniques through live workshops, weekly webinars, a member site, and seminars. Having flipped over 1,000 deals herself she is more than qualified to share her vast knowledge of real estate investing with America. Dwan is affectionately known as the “Queen of Short Sales”® and is considered to be the Nation’s #1 Expert on Short Sales & Foreclosures. She has written three best sellers, “Short Sale Pre-Foreclosure Investing” & “How to Sell a House When It’s Worth Less Than the Mortgage”, her most recent New York Times best seller was written with Steve Forbes…SuccessOnomics. She is highly sought after and has been featured on Fox and Friends, MSNBC, Naomi’s Good Morning, Colorado and Company, and many other TV, radio, podcasts, and print medias.